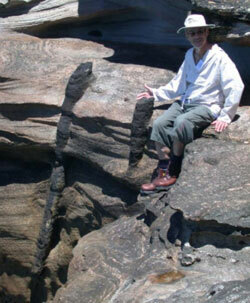 Two log-like objects enclosed within sandstone at Box Head, 40 km (25 miles) north of Sydney, New South Wales were reported in an article in Creation magazine and Journal of Creation as vertical fossil tree trunks. 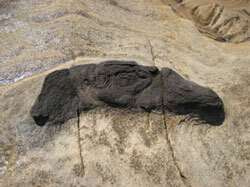 However, subsequent investigation suggests that they are not broken tree trunks but unusual iron concretions. Such a change in interpretation does not alter the evidence for large scale watery catastrophe present in the sandstone layers or the linkage of the Three Sisters to Noah’s Flood. Figure 1. The two vertical ‘logs’ as presented in Creation magazine. Looking south about 200 m around the eastern side of Box Head, the wave platform is 10–15 m above the ocean (Photo by Andrew Taylor). 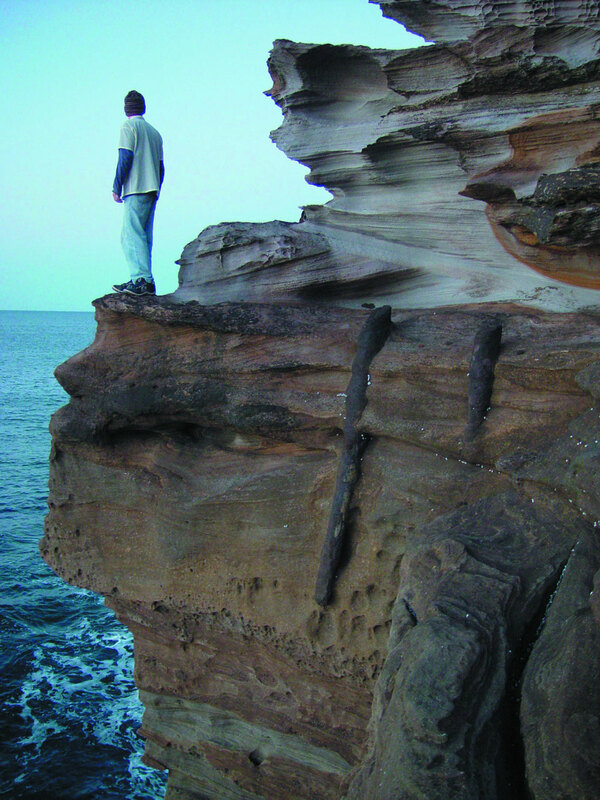 There are two vertical log-like objects enclosed within sandstone on the wave platform overlooking the South Pacific Ocean at Box Head, 40 km (25 miles) north of Sydney, New South Wales (figure 1). These were brought to my attention in November 2002 by Andrew Taylor, who thought they looked like broken tree trunks and sent me a photo. I reported them in an article in Creation magazine1 in 2003, describing them as vertical fossil tree trunks, and said the trunks were broken with no sign of soil or roots, that they were washed into place, and testified to the violent forces which uprooted and smashed an ancient forest. 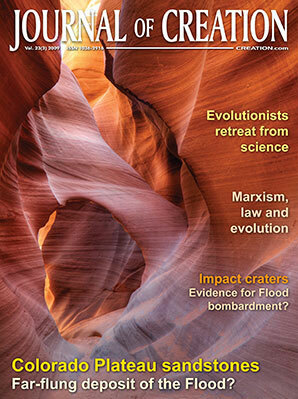 I also discussed them briefly in 2004 in an article in Journal of Creation2. Figure 2. Geological map of Box Head showing approximate location of the log-like objects. However, a site inspection of the objects and the sandstone of the area in October 2006, and more recent discussions with geologist John Byrne, who is especially interested in fossil trees and other geological anomalies,3 suggest that they are likely not broken tree trunks but unusual iron concretions. Such a change in interpretation does not alter the evidence for large scale watery catastrophe present in the sandstone layers or the linkage of the Three Sisters to Noah’s Flood, as I argued in the previous articles. The formation is part of the Narrabeen Group which sits beneath the Hawkesbury Sandstone, and is approximately equivalent to the formation comprising the Three Sisters, over 100 km (60 miles) west. Excellent cross bedding is obvious in the layers around the vertical cylinders (figure 1). Figure 4. 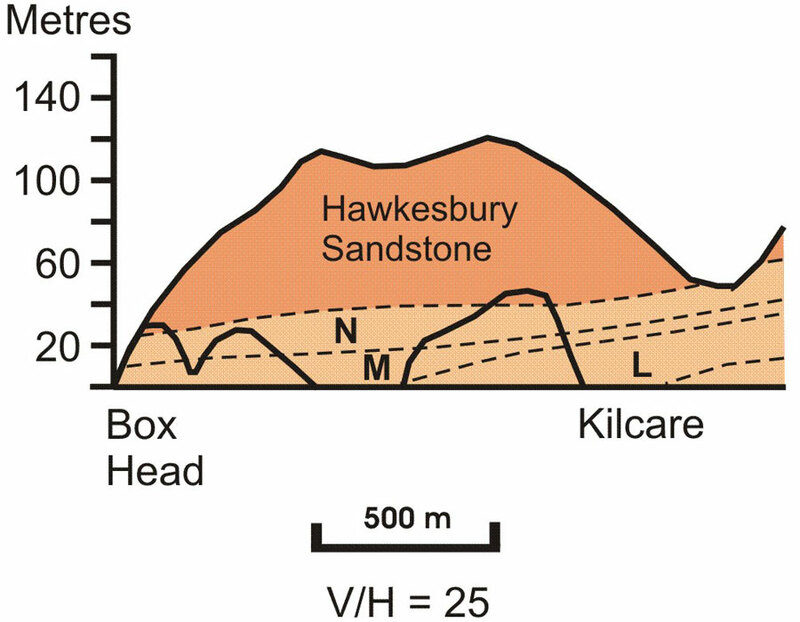 Simplified vertical profile of the Terrigial Formation (from McDonnell, ref. 4.). The sandstone strata comprising the wave platform at Box Head are labeled Unit ‘M’. Figure 5. 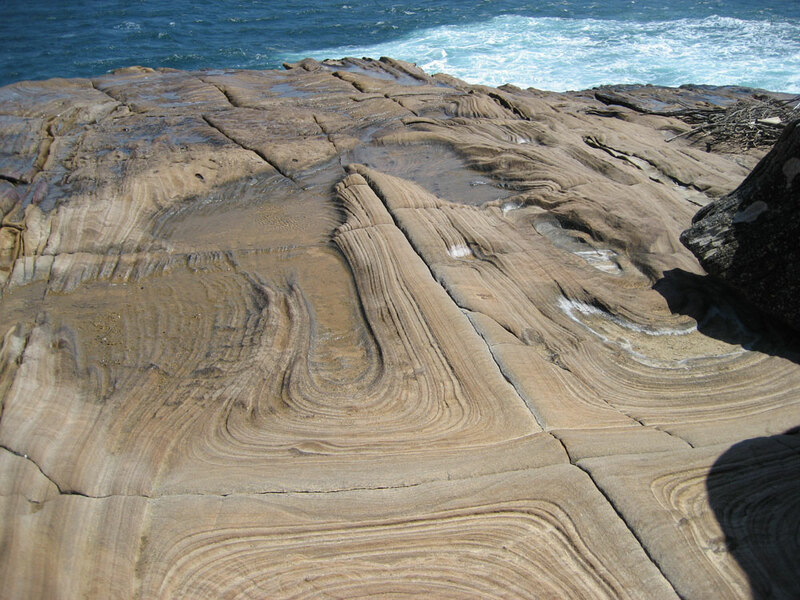 Iron-rich Liesegang bands create a rectangular pattern on the wave platform within the widely spaced joints in the sandstone. One feature on the wave platform (figure 5) is an unusual pattern produced by iron minerals within the sandstone. Orange ‘Liesegang bands’5 swirl across the surface and produce a dramatic pattern of nested stripes. Widely spaced joints have cut the sandstone into a large rectangular ‘pavement’, and the Liesegang bands tend to be isolated by the joints. The striped pattern is generally contained within each rectangular block and is rectangular in shape. Another feature of the platform is that the iron rich areas of the sandstone are more resistant to erosion. 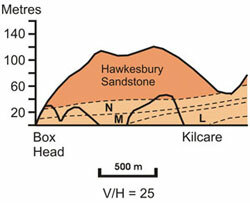 Consequently, the sandstone surface is uneven with iron-rich zones standing proud of the surface and iron-poor zones being slightly depressed (figure 5). This emphasizes the colourful pattern of swirling rings, giving them the appearance of a bass relief. Figure 6. 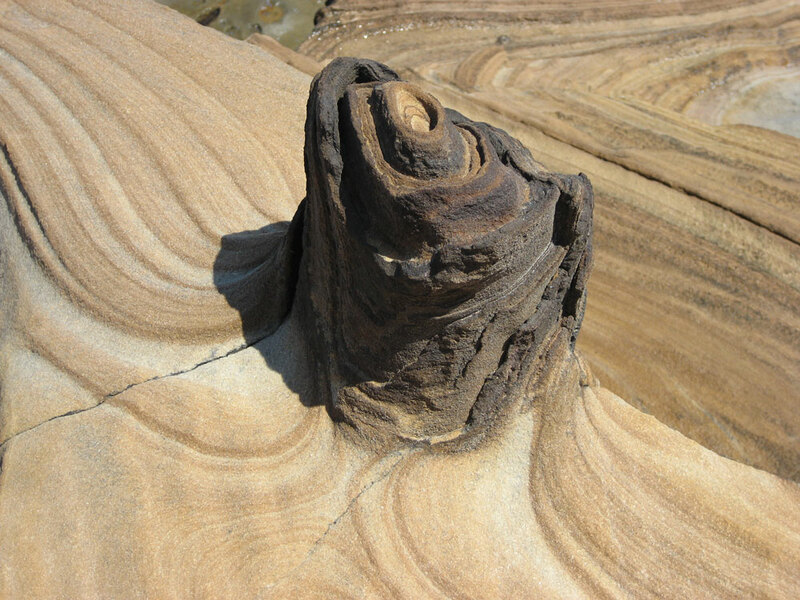 Central iron rich core of a Liesegang swirl sits about 30 cm above the rest of the sandstone surface. In a few places on the platform, especially toward the middle of some swirls, the iron content has become extremely concentrated, giving the sandstone a dark brown, almost black, colour and making it very resistant to erosion (figure 6). The iron-rich black sandstone centres of the swirls stand higher than the surrounding surface and, at first appearance, look like protruding vertical logs. 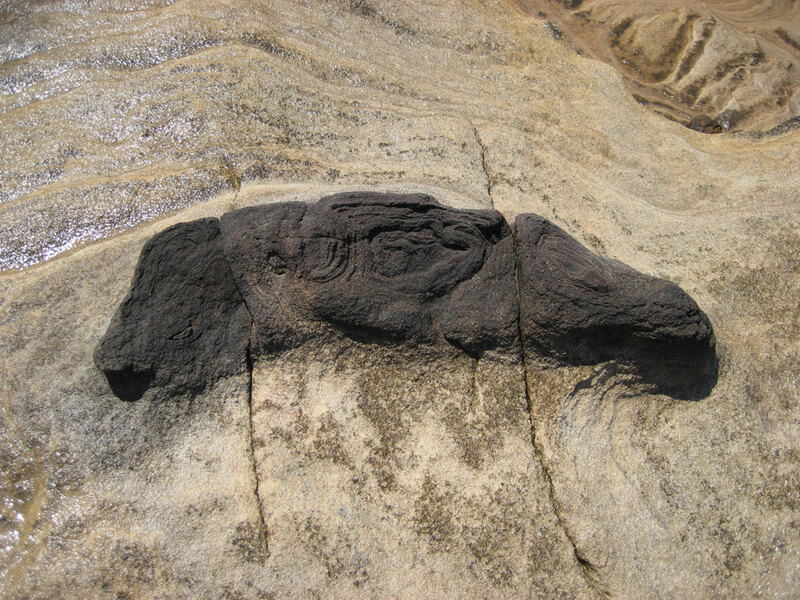 It is clear that the example in figure 6 is not a log but part of the iron stained pattern in the sandstone. At the edges of the circular ‘object’ it can be seen that the swirled pattern of the orange bands continue into the black, iron-rich zone. Although the central swirling bands give the appearance of tree growth rings, on closer inspection it can be seen that the bands are quite thick and form a nested spiral shape. They are not thin and concentric like tree rings. Figure 7. Close up of the long, iron-rich vertical cylinders in the face of the wave platform (Photo: Chris Herbert from ref. 3). From a distance the two vertical objects in the edge of the wave platform look like logs, and even give that appearance close up (figure 7). However, it can be seen that in places the cross bedding in the sandstone seems to continue through the cylinders suggesting that they are part of the sedimentary deposit and not logs. Further, the top ends of the cylinders show no sign of annular rings (figure 8). Figure 8. Close up of the end of the shorter vertical cylinder does not show any evidence of tree growth-rings. There are other similar dark brown structures nearby that protrude from the surface of the sandstone and that are clearly not broken logs. Neither of the examples in figure 9 or 10 has a circular cross-section. Rather they are elliptical, and the patterns on the ends of the objects bear no resemblance to annular growth rings. Further, the texture of the surrounding sandstone continues into the dark brown portion of the objects indicating they are not separate objects but part of the original sand deposit. Figure 9. Another iron rich vertical concretion protruding from the sandstone surface in the area. 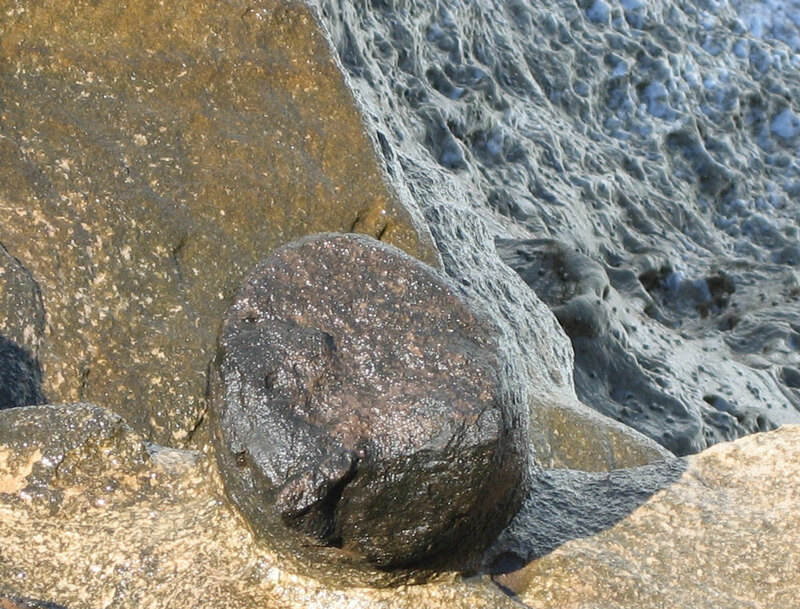 The elongated elliptical shape of the section and the pattern of the bands make it clear that the object is not a log but the result of a swirling pattern of iron staining. Figure 10. 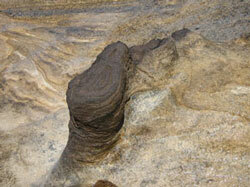 Yet another concretion standing vertically on the sandstone—clearly not a log. 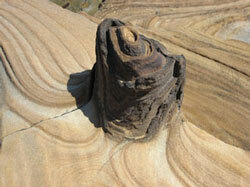 On close inspection, the vertical cylindrical objects at Box Head, New South Wales, do not have any distinctive wood-like features and the texture in the enclosing sandstone deposit seems to continue through them in places. 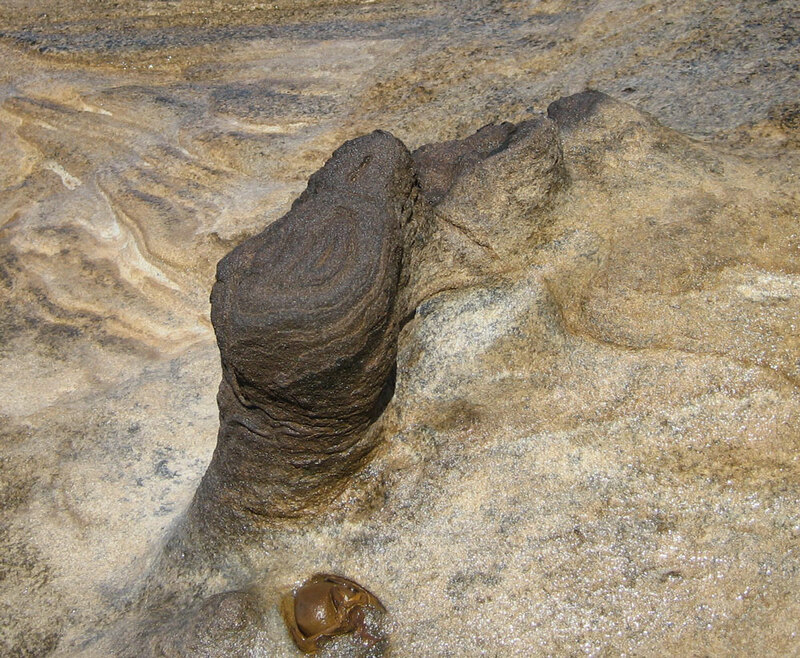 Further, there are many other protruding iron-rich concretions of various sizes and shapes in the same sandstone unit on the wave platform in the area, and these are clearly not tree trunks. 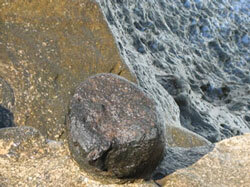 Contrary to previous reports, the two objects do not seem to be tree trunks but unusual iron concretions. That these cylindrical objects are not tree trunks does not diminish in any way the abundant evidence for large scale watery catastrophe present in the sandstone layers in the area, and within the strata of the Sydney basin. Nor does it affect the idea that the Three Sisters at Katoomba formed during Noah’s Flood, as previously described in Creation magazine and Journal of Creation. Walker, T, Three Sisters: evidence for Noah’s Flood, Creation 25(2):38–42, 2003. Return to text. Walker, T., The Three Sisters: strong evidence for Noah’s Flood in Australia, Journal of Creation 18(3):76–81, 2004. Return to text. 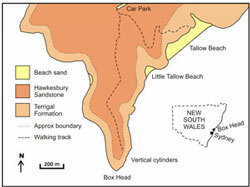 John Byrne has published material about Box Head ‘fossil trees’ at ‘Geological sites and localities, with their points of interest’ under the heading ‘Gosford’; <http://www.lachlanhunter.deadsetfreestuff.com/JB/geo-sitesG.htm>, 2008. Return to text. 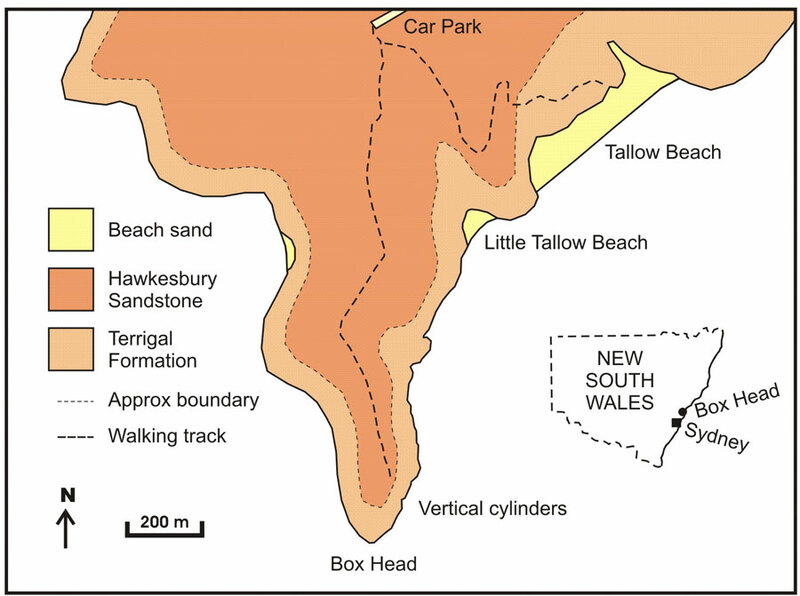 McDonnell, K.L., Notes on the depositional environment of the Terrigal Formation; in: Herbert, C. and Helbert, R., A Guide to the Sydney Basin, Geological Survey of New South Wales Bulletin 26, pp. 170–176, 1980. Return to text. Liesegang rings are a nested series of coloured bands caused by rhythmic precipitation of minerals within fluid saturated rock. 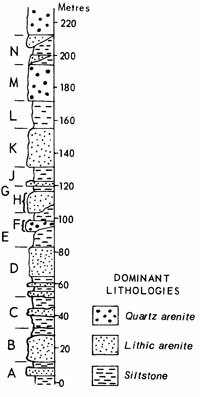 The bands are caused by variation in the iron content of the mineral cement precipitated in the pore spaces between the grains. Return to text.